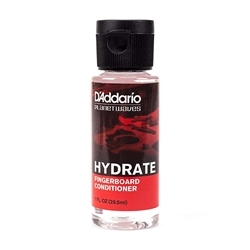 Hydrate by D'Addario is the ultimate treatment to restore the character of guitar fingerboards on all stringed instruments. Hydrate's unique formula of oils and cleaners removes dirt and grime while restoring moisture to the fret board, preventing cracks and other damage that can happen when a fingerboard becomes dry. Hydrate is also excellent for removing rosin from bowed instrument fingerboards. From hydrating emollients to our fret polishing system, our rejuvenating fingerboard products will keep your instrument playing like new.